I Swear It’s (still) Not Too Late! I’ve been quite busy the last few weeks with garden chores, civic work, a wonderful once-a-week discussion group taking a course called “Peace, Justice and Sustainability” and all kinds of fun things! But I’m always thinking of this blog and how I might best use it to inspire you, my readers, to find ways to create a way of living that’s significantly more connected, more vibrant and more fulfilling than the one we find ourselves in today. Now is the time- I swear it’s not too late- to take stock and to begin re-creating our future in ways that are not based on cheap, plentiful and polluting oil but on localized food, sustainable energy sources, resilient local economies and an enlivened sense of community well-being. Since I started this blog almost three years ago, we’ve all witnessed what appears to be an increased rate of decline in the health of the Earth, as she reels from the affects of climate change and resource depletion. At first a gradual process, the changes are becoming increasingly faster as our Earth reels from humanity’s impacts on her. In these 3 years alone, we’ve seen everything from Sandy Superstorms to disappearing honeybees and monarchs, from California’s too-late-for-rationing drought to thousands of beached sea lions. Along with the effects of climate change, perhaps you’ve also noticed the lack of good paying jobs, or the rising price of groceries and college degrees. Perhaps you’ve seen more potholes in your town, or fewer public works projects? Many of America’s towns and cities are experiencing gradual, but definite, declines in their abilities to replace and repair aging infrastructures, while large corporations often fail to provide living wages for their employees. Perhaps you know someone that is no longer able to afford tires for the family car, a new roof for their home, or even a needed prescription? Maybe that someone is you. I keep practicing and preaching local food production, and am currently involved with a group of people working to bring a food cooperative to our town, serving as coordinator of a large community garden and have started spending Friday mornings teaching a group of young women going through rehab how to grow and preserve food. But that’s my thing. 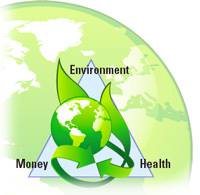 Perhaps you are more interested in renewable energy systems, or developing websites or practicing wholistic health care. My chemist friend Gerald has developed and is marketing a line of green cleaning products, and another good friend is developing a close knit community of folks learning to play music. Maybe you have a useful skill you could turn into a moneymaking business; I understand that chimney sweeps are in high demand because of the increased use of wood stoves for home heating use. Home-crafted beers have taken the place of moonshine, and it’s difficult to find good, reliable repairs for almost anything! I, for one, could use the expertise of an orchardist to help me learn to grow fruit and berries organically. We all have strengths and talents that can be shared with others, for either love or money or both. Those skills are going to be the backbone of tomorrow’s localized economies. Which brings me back to that course I mentioned earlier…our group members are trying to be that change we wish to see, but in a nonviolent way; every week we each declare an intention of some action we’re willing to take, either at home or in our community, that might help us live in a more peaceful, just and sustainable way. We’re concerned about our own futures, as well as those of our children and grandchildren and are committing to changing it, instead of just talking about it. Actions as small as turning off the water when brushing our teeth or writing letters to our elected officials are declared, as well as much larger ones that will require a great deal of time and energy to accomplish have been declared by our members. We swear it’s not too late! This blog normally has three overarching categories that I write about: frugality, food gardening and community. All the other topics seem to fit pretty neatly into one of those three. But there are other topics I’d like to cover that don’t fit so neatly into any of those familiar three. And since this is my blog, I’ve decided to start a new category called “Here’s Your Sign”. 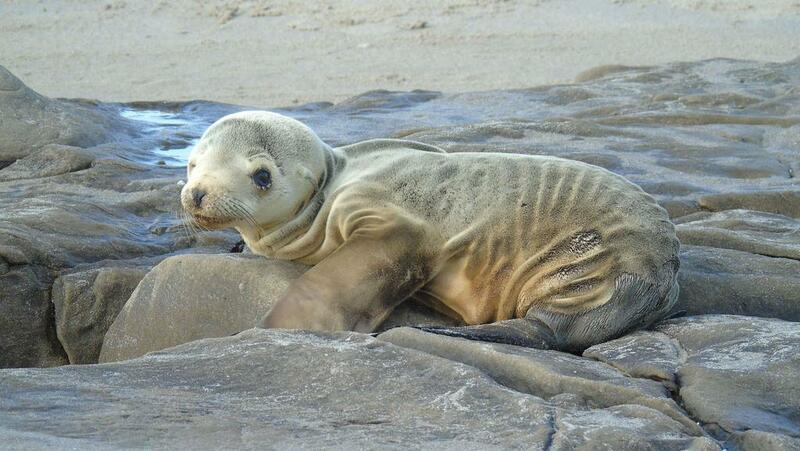 To start things off, I wanted to call your attention to the plight of the thousands of starving and stranded sea lion pups that are washing up on the shores of Southern California. Experts say that warmer ocean waters have disrupted their food supply, forcing their mothers to abandon them as they go further and further out to sea to find food. The pups, mostly weighing about 20 pounds when they should weight 3 to 4 times that, are helpless and weak and are washing ashore. National Marine Fisheries Services are overwhelmed and are only able to tube feed a small number of the doe-eyed pups. Ben Stein On Fox News: “Despite What Global Warming Terrorists Will Tell Us, The Science Is Not Clear On Climate Change.” Here’s your effin’ sign Mr. Stein! I recently touched on a concept called “The Green Triangle” that was put forth by author, editor, and simple living adherent, Ernest Callenbach. 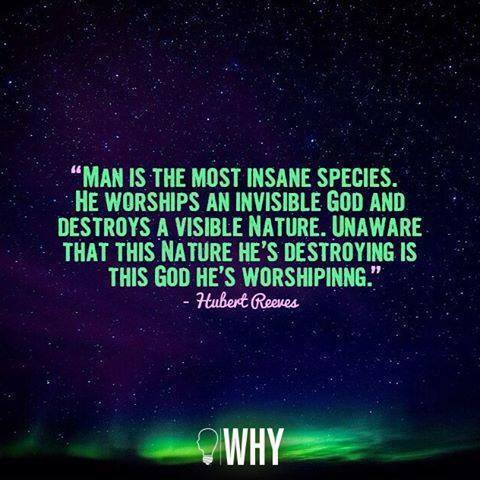 Seems he was able many years ago to put into words a principle that I’ve often used to guide me in my daily choices and decisions concerning my money, my health or the environment. 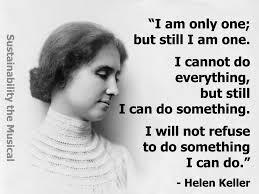 The principle that relates these three points is: Anytime you do something beneficial for one of them, you will almost inevitably also do something beneficial for the other two – whether you’re hoping to or not. I’ve also written several times about ‘win-win’ situations. Here, here and here for example. The Green Triangle is a ‘win-win-win’ situation in my eyes and as someone who cares deeply about those three things, I find it a helpful tool. I’ve used it so often over the years that I rarely ask myself anymore, “Self? What does the Green Triangle indicate in this situation?” But, it wasn’t- and isn’t- always that easy, so I thought perhaps it might be helpful to you if I could tell you of a few instances when it’s been a guiding light for me. I long fretted over “Which is best? Local? Organic? Grass Fed?” Where my food is concerned, my health was my first consideration. So with staying healthy as my primary motivator, I felt comfortable with answering those questions by adopting a plant-based diet. Period. As it turns out, by not buying meats, I’m improving my arteries, while saving money (beans, grains, nuts, eggs and greens are far cheaper sources of protein than meat) AND protecting the environment from the harm that Big AG conventional meat producers are causing. Green Triangle =ding!ding!ding! Whenever I walk or ride my bike, I’m putting the Green Triangle into effect. I’m saving gas money and wear on my car, I’m improving my clogged arteries, and not contributing to the CO2 emissions that driving causes. ding!ding!ding! Occasionally though, it’s not so clear-cut or even when it is, it’s not so easy to adhere to my own principles. When Michael and I were dating many years ago we had an old, heavy cooler that I couldn’t give away, try as I might. There wasn’t anything wrong with it, we simply wanted to buy a lighter one, with wheels and drink holders and little dividers inside that kept your hummus from touching your lettuce or whatever. I distinctly remember standing in the backyard and Michael saying to me that he felt we are responsible for the things we purchase until the end of that things’ life cycle. That simple statement stayed with me, and the longer I live with it, the more I see how true it is. We didn’t buy the new cooler then, nor have we ever bought another one, because the karma of keeping the damn old thing boomeranged, as karma does, you know. Years later, a friend was moving and offered us his ‘old’ cooler-and it was just what we’d wanted! We still have the ‘old old’ one, which I use for protecting tender young plants on cold spring nights ;), as an extra camp seat, and as storage for camping gear during the off-season. We never did have to spend the $30 dollars a new one would’ve cost us, the landfill is STILL minus one steel cooler, and I rest easy knowing I made a good decision. ding!ding!ding! Before I close, I want you also to understand that making good choices, whether using the Green Triangle or by following the advice found in my fortune cookie, is still really hard. I don’t always make the best food choices or purchasing decisions (did I ever tell you about my weakness for chocolate chip mint ice cream or my Imelda Marcos style shoe collection?? ), and some days I don’t gave a rat’s a## about the polar bears (ok, that’s not quite true) but being ever-mindful about my consumption of every thing that comes through my life has saved me lots of cash, helps me stay healthy and hopefully, has saved a polar bear somewhere as well. Maybe this Green Triangle thing can help you make better choices too. ding!ding!ding! It’s been said our next wars won’t be over oil, but water. When I lived in California a dozen years ago, everyone living in the suburbs had sprinkler systems, set on timers, that would come on and go off at predetermined times and days. Most houses didn’t have individual water meters, and were only billed a set fee each month. This of course led to serious water wastefulness and more than once I witnessed sprinklers running while it was raining. I also witnessed sprinklers that had gotten knocked awry and were simply filling the gutters. I saw first-hand the giant irrigation sprinklers on wheels that covered entire fields, the canals that had been built EVERYWHERE to channel snow melt water down to the valley from the Sierra Nevada mountains, and yet more growing fields that were customarily flooded to give the food grown there the moisture it needed to survive. I even remember seeing road side signs in some areas asking voters to ‘say yes’ to allow water to be channeled from the Colorado River to the Central Valley. It’s a freaking desert there folks, yet it’s considered “our nation’s breadbasket”! Meanwhile, record-breaking droughts are occurring on the West Coast of North America, as life-changing flooding is occurring in England-both events that have long been warned would occur due to our changing climate. And we here in the modern world keep right on shitting in our clean water supplies and using tremendous amounts of water to extract shale oil from rock for crying out loud! I know I’m not alone in my concerns about the ability to grow enough food to feed ourselves in a water-challenged world, not to mention the health challenges and risks that such a scenario will pose. It’s no longer a matter of IF this comes to pass, but WHEN. Looks like it’ll be 2014. So, what can we do, as individuals and as communities? I say WE because if you are alive, you’re part of this conversation. There are many small things we can do in our homes and daily lives to reduce our water needs, and even though I suspect I’m preaching to the choir repeating them here, just consider them ‘gentle reminders’. I disagree that individual efforts to use fewer resources of any kind are for naught so I’m always looking for creative new ways to conserve them. And with water savings, I often get to see the tangible results, whereas with other resources it’s not so immediately apparent. 1. Shower Less-because Michael has had surgical wounds and vacuum systems and chemo pumps attached to his body since last June, out of necessity he’s had to shower less often. NO ONE has refused to hug him yet, so it’s a water intensive ‘habit’ we Americans need to seriously reconsider. As per their custom, his English family only bathed him once a week as a child. gasp! yet he STILL managed to survive! 3. If you MUST water the lawn, convert it to food growing areas first. Then MULCH those areas to prevent evaporation and run off. Most municipalities will deliver a load of shredded leaves in the fall for just that purpose. Mine does anyway. 4. Harvest rainwater-in barrels, buckets, ponds or whatever you can manage and use it to water your garden, house plants, etc. 5. Use low-flow shower heads and flow restrictors on all your faucets. They’re easy to install and will pay for themselves quickly. 6. Only run your dishwasher and washing machine when full. If you need more dishes or clothes to last until they’re full, figure out a way to get enough extra to make that happen-yard sales often have dishes, glassware and clothing to make that an inexpensive and earth friendly option. 7. Use a phosphate-free laundry detergent, then reroute the drainage from your washing machine to a home orchard or garden or permaculture swales. I used to do this when I lived in Florida, and had THE BEST oranges and grapefruits with no other irrigation used. This concept is called “Gray Water” and there are lots of books and websites that explain it in detail. 8. Wash your own car at home, with a spray nozzle on the hose. Save money, save water, get exercise and free Vitamin D while you’re at it! 9. Water your garden or landscape plants in early morning, and at soil level rather than from above. If watered during the heat of the day, much of the water can be lost to evaporation. 10. Route the water from your dehumidifier to somewhere BESIDES the drain. Taking the drainage tube off completely will fill the reservoir, allowing you to capture it for watering houseplants, filling the dog’s bowl, filling the washing machine or flushing the toilet. You can do the same with water harvested from window air conditioners, rinsing dishes, washing vegetables, or rinsing sprouts. 11. Plant native and drought tolerant vegetables, berries, small fruits and trees. They naturally use less water. 12. When rinsing recyclable food containers, don’t wash them separately. Rinse them when you are already hand or electric washing the rest of the day’s dirty dishes. Try using one of the other sources of ‘free’ water I’ve mentioned above. I’ve watched people quite devoted to recycling use 5 gallons of water to rinse out one ketchup bottle before placing it in their recycling bin. REALLY? 13. Cover cooking pots, preventing much evaporation and preventing the food from . 14. Protect your water shed: Don’t flush drain cleaners or medications. Don’t use drain cleaners, bluing agents or garbage disposals. Don’t spray your lawn with weed killers or other poisons-there are many environmentally-friendly alternatives available now. Fence your cows, horses or other livestock out of creeks and streams. DON’T DRINK AND DRIVE LARGE OIL TANKERS. LINE YOUR COAL ASH PONDS TO PREVENT LEAKING INTO PUBLIC WATER SUPPLIES. MAKE SURE YOUR FACTORY’S WASTE REMOVAL PIPES DON’T HAVE LEAKS. DON’T BUILD OIL PIPELINES THAT ARE 2,151 MILES LONG WITHOUT PLANNING FOR SPILLS AND LEAKS. wait! INSTEAD, DON’T BUILD OIL PIPELINES TO BEGIN WITH. AND FINALLY, WHEN YOU BUILD YOUR NEXT OCEAN-SIDE NUCLEAR REACTORS, MAKE SURE YOU INSTALL THE POWER GENERATORS ABOVE SEA LEVEL. YOU KNOW, JUST IN CASE THERE’S AN EARTHQUAKE OR TSUNAMI OR SOMETHING. I spent most of this week just like last- trying to stay warm. In between times I cooked a fair amount, wrote some long overdue letters (on yard sale stationary and mailed them with ‘salvaged’ stamps~read on! ), and did a lot of reading. Not too much excitement when it’s this cold. Monday: Mailed my annual bundle of used greeting cards to St Jude’s Ranch. Children that live there use the card fronts (if they’re not written on) to recycle into new cards that they then sell to earn money. I wrote here about it last year, but I have a lot of new readers since then, so I thought it might be something they’d like to know about too. Repurposing those cards is even better than recycling them, and makes me even happier when I can mail them for free. Yes, that’s right…this week I mailed the cards and a small package to my daughter, all free, because I keep getting things in the mail that don’t have their stamps canceled! And just to add frosting to the cake, I was even able to reuse the original envelopes that those uncanceled stamps were stuck to, which meant I didn’t have to peel off the stamps, nor buy mailing envelopes! Postage savings: 8 stamps at the new rate of 49 cents each= $3.92 plus whatever new mailers might’ve cost me! Thursday: Stitched up a long tube of fabric cut from an old curtain, filled it with sand and used it to block the cold air coming into my bathroom from the unheated bedroom connected to it. I could’ve used grits, rice, buckwheat or kitty litter, but sand was what I had on hand. Yeah, I could’ve rolled up a towel too, to stuff underneath the door, but the tube can also be moved around to different doorways and is easier to ‘move out of the way’ when I do want to open the door, and it hangs over the knob when not in use. Friday: Found a brand new 3M scrubber in the street when I took my walk. I’ll cut it into 3 pieces (sharpening my scissors at the same time) and use them for scrubbing pots and pans. Savings: $2 or so for three scrubbies? Let me begin this long rant by saying I already miss Pete Seeger and I’m quite tired of freaking five degree temps, so maybe that’s colored my usually optimistic outlook on things. I should also tell you that the provisions put forth in the new Farm Bill are confusing, and that I voted for O’Bama. Both times. I think his State of the Union address last night was beautiful oration, and I did like a lot of what he had to say, but I totally disagreed with his call to retrofit our economy for natural gas. He’s going to make it easy for businesses to open factories that run on natural gas, by cutting governmental red tape. He never mentioned that 90% of the oil and gas wells drilled in America today are fracked — there could be no oil and gas boom without it. Everyone knows that there are no easy answers to the problems of Peak Oil and the fact that we’ve, well, peaked. However, he did say “… the debate is settled. Climate change is a fact.” Thank you Mr. President for that acknowledgement. But shouldn’t the conversation from our nation’s leader at this point include at least some mention of alternatives to an energy-dependent future besides “In the coming months, I’ll (build on that success) by setting new standards for our trucks, so we can keep driving down oil imports and what we pay at the pump“? By God, if we had to pay the true costs of gasoline at the pump we’d ALL be riding our bikes, taking a bus, a train or walking! Our pump prices don’t even begin to reflect the environmental costs of that fuel. Just sayin’… And our food prices don’t reflect their environmental costs either, but I’m digressing here. WHERE is the conversation about plans for mass transit and alternative transportation systems? WHERE is the conversation about retrofitting older buildings and factories and homes with simple systems like insulation, solar panels and windmills? WHERE is the conversation about our nation’s cities and towns converting public lands and commons areas to growing spaces, to food forests and community gardens? WHERE is the conversation about Americans needing to learn the skills needed to produce the foods and goods and tools and services we need to become self sufficient? Those conversations really do take place on millions of websites, in magazines and living rooms, but they’re never spoken of by our government. Well, I’M MAD AS HELL AND I’M NOT GOING TO TAKE IT ANYMORE! In the last year or so I’d begun to feel somewhat hopeful that maybe the economic and financial experts hadn’t gotten it quite right, and that maybe our economy IS recovering. I’d also begun to feel that maybe the energy experts hadn’t gotten it quite right either and maybe we haven’t reached Peak Oil-yet. But as O’Bama said himself: “climate change is a fact”, and those of us lucky enough to live in First World countries can not ‘carry on as usual’ and expect that to change. I truly fear for my grandchildren at this point. I fear that they won’t have enough food, clean water and air to live healthy and productive lives. The government is paying some growers in California to not plant again this year because of lack of water. Let me say that again: The government is paying growers in California to not plant again this year because of lack of water. The ongoing drought in our nation’s breadbasket is so very serious and when I hear our President speak about ‘setting new (MPG) standards for our trucks’ it makes me angry. You ask, “So, what are you gonna do about it?” I’m going to keep on writing about, talking about, and working for, the changes I think need to take place. But I’m going to write a little longer, talk a little louder and work a little harder. I’m going to continue to grow and preserve as much of my food as I can and teach others to do the same. I’m going to walk and carpool more-the walking keeps me healthy and doesn’t add to our environmental problems. I’m going to support local organizations like One Acre Cafe and The Livable Communities Group that are working to make a difference in our community, not by offering handouts, or asking for them, but that are “leaning in”, to use a new catch-phrase, to find out first hand what’s needed to make lives better. I’m going to learn new skills and share them with others whenever I can. I’m going to get more involved with politics so that the type of leaders we need to make big change get elected. I’m gonna write letters to the editor and sign petitions. And that’s just for February folks! I’m mad as hell and I’m not gonna take it anymore! The ‘About’ page of this blog, written exactly two years ago states: “If we collectively plan and act early enough, we can create a way of living that’s significantly more connected, more vibrant and more fulfilling than the one we find ourselves in today. Now is the time to take stock and to start re-creating our future in ways that are not based on cheap, plentiful and polluting oil but on localized food, sustainable energy sources, resilient local economies and an enlivened sense of community well-being. This blog is simply about my attempts to visualize and help create that new way of living!” I still believe in this statement fervently. I hope you do too. I had a bad day. Hell, I had a bad week! Michael had to have a second unexpected surgery on Tuesday (that went very well) , the weather’s been gray and cold, I’m not ‘ready’ for Christmas, nor do I have any spirit for it, and I’m simply tired of cancer and all it entails. Even as I write this, I realize I’m whining and that people don’t read this blog because they want to hear about my problems. I hope you’re reading it because you are, like me, looking for inspiration and optimism in finding ways to deal with the challenges of Peak Oil, Climate Change and Economic Collapse that we’re facing in our lives and our world. You can delete this post now if you can’t handle some negativity because that’s how I’m feeling today, with a sense of urgency about the transitions that need to take place in our lives, in our households and in our communities. Surely I’m not alone? Over the last five years I’ve studied countless books, blogs and articles to try to understand the issues that I then try to relay to you in this blog, without any hysteria or hype, just the facts ma’am. However, I’m noticing a change of tone in the things I’m reading these days. Rather than authors writing about mitigation techniques, which the dictionary defines as lessening the force or intensity of something unpleasant, they’re now discussing adaptation, which is defined as altered behaviors. In other words, it’s the next step after mitigation. The latest things I’m reading are now focusing on how we’ll have to adapt to all kinds of differences in our daily lives, as the energy supplies, infrastructure, resources, money and water dry up. We’re wayyy past changing lightbulbs and clipping coupons folks! Locally, I’ve heard stories from people I know and trust about how they’re trapping and killing backyard squirrels to supplement the beans on their dinner tables. I’ve listened to a well-educated and intelligent family member cry over her inability to find a decent paying job, even though she’s living in a major metropolis area and has put out many applications. I’ve seen firsthand the uptick in folks coming to the churches, food pantries and soup kitchens for food, some WHILE ON THEIR LUNCH BREAK from school or work. I’ve heard from car dealers about the shortage of affordable and reliable used cars for sale across the country and from renters about the shortage of affordable, decent places to live. I’ve witnessed the progression of gold and silver buyers, the ‘cash for your title’ outfits, and the “Payday Loan” sharks that are renting cheap buildings and catering to the poorest among us. I can’t help but notice the number of one hundred year storms that have occurred in the last couple of years alone, while more and more cities and states are leaving the storm damages and destroyed infrastructures to be dealt with by the survivors. I’ve also learned that some countries are already putting into place strategies and transition plans to enable their populations to weather what’s coming. In other words, we’re no longer doing much mitigating, we’re adapting already!